“In our creation story of where we first began as people on this earth, that place was sacred long before anybody from Europe arrived and saw the place. . . . We hold our lands sacred, but these lands are more sacred because of the history, because of the myth and what we are pleading for is some understanding. . . . This is more than an argument over a plot of land. It is a debate of two cultures and the understanding of the sacredness and what is sacred.” Eleven years ago on February 26, 1999, Dakota spiritual leader and Episcopal minister Rev. Gary Cavender spoke these words in a moving speech at a press conference relating to opposition to the construction of Highway 55 through the Coldwater Spring area near Fort Snelling in Hennepin County, Minnesota. Despite the clarity of his words, the knowledge they contain has been questioned time and time again by those seeking to undermine Dakota claims to the area. Rev. Cavender died in April 2009. His words are worth hearing again. We are coming here to talk about sacred land, and especially the sacredness of that place. In our creation story of where we first began as people on this earth, that place was sacred long before anybody from Europe arrived and saw the place. Because of the topography of the land and because of the coming together of two great rivers (Minnesota and Mississippi) it is called “Md ote” or the throat of the waters, and they named a town after it–Mendota–although it is pronounced altogether different. In our Creation myth we the Dakota, the Seven Fires of the Dakota, came from the belt of Orion–the seven planets of the belt of Orion, the seven stars–and arrived at the convolution of the Minnesota and Mississippi Rivers, and so in some respects it is our Eden, and the land around there is sacred as well. There is that sacred spring that is in negotiation, that sacred spring is the dwelling place of Unktehi, the God of the Waters, and in that spring there is an underground river that goes into the big river, and that is his passageway to get out into the world. To block the sacred passageway would be courting with drought and things of that nature that have to do with water, because after all, this is the God of the water. So when you hear a thunderstorm and it starts to rain, that is the underwater God having battle with the Sky God and the reason for that battle is so that the rain may come down and replenish the earth, and the Sky God is fighting–throwing down thunderbolts to fertilize the land. That is a scientific fact, and so it is not without reason that this land should be sacred to us, and so the Underwater God lives there. We came there as human beings and so that is our Eden, and the irony of it all is that in 1862-1863 that was almost the end of us as people, because that was the Ft. Snelling concentration camp. It may have been a full circle for us–the beginning and the ending, which is sacred in and of itself, but the land is sacred. The high bluffs where we went to track provisions, the throat of convolution of the 2 rivers where we got our start and almost where we got our ending. There are bodies there, there is a sacred cemetery there. Maybe all of it is gone but it is still sacred. We hold our lands sacred, but these lands are more sacred because of the history, because of the myth and what we are pleading for is some understanding. To understand our sense of sacredness of the land. To use our image as the ultimate environmentalists–we may not be, but we have a connection to the land that perhaps you don’t understand and so this is more than an argument over a plot of land. It is a debate of two cultures and the understanding of the sacredness and what is sacred. We can’t say that the land has nothing on it and disregard the sacredness and go ahead and build on it. Wasicun seem to have the ability to prioritize, and when it comes to progress, spirituality or sacredness takes a back seat to progress. We don’t have that understanding, it is not in us, even though we’ve been in your culture for at least 200 years now and we’ve only been citizens of our own land since 1925. So how can we expect you to understand those things when you didn’t even recognize us as human beings until the 20th Century. But what we’re asking for is the beginning of understanding. Use this sacred place as a neutral ground to start a journey of understanding each other and leave it alone. Our people’s beginning spirits are there and our people’s ending spirits are there. All of the Gods are there. The Wakan Tanka is there. The Wakan Tanka is everywhere and so for us it’s only a ltittle patch of land we’re asking for. The economy isn’t going to collapse. There is an alternative way to solve the problem, but for us it is a great, great sacrifice and we’ve sacrificed so much for so long. All we’re asking for is a little understanding and perhaps respecting what we hold sacred! The destruction of mounds in Minnesota keeps happening on a regular basis, which is why as the Minnesota Historical Society says, “History Matters.” Why is it that mounds are considered dispensable places? Why is it that agencies and companies go to such great lengths to convince us that there is no further harm possible to them, that the worst has already happened, that anything should be permitted? When I first wrote this essay eleven years ago I did not appreciate the possibility that it would continue to be relevant so many years later…. “The countless mounds, enthroned on the hilltops like monuments of a long-gone race, form an immeasurable cordon along the blue horizon.” Henry Lewis, describing a view near Wabasha around 1846, [including an erroneous reference to the builders of the mounds, as discussed below]. Minnesota’s history was recorded first in places such as burial mounds. History is usually said to begin with narratives, especially written ones and by that measure burial mounds are prehistoric. But if history functions in part to communicate a respect for the past, a reverence for those who went before, and a clear sense of that people’s understanding of the place in which it lives, then history in Minnesota may have begun with the construction of the first mound. There is no question that among the most endangered and most beautiful culturally important places in Minnesota today are the mounds along the rivers where for thousands of years people have buried their dead. In an interview with Minnesota Public Radio in 2002, State Archaeologist Mark Dudzik pointed out that if you plotted the placement of burial mounds in southern Minnesota on a map overlay and then took away the original map, the arrangement of these mound locations would trace the course of the Minnesota and Mississippi Rivers. This tracing continues to grow fainter, as more and more mounds disappear from the landscape. A view of Indian Mounds Park in St. Paul, around 1898, looking south along the Mississippi River. Minnesota Historical Society. 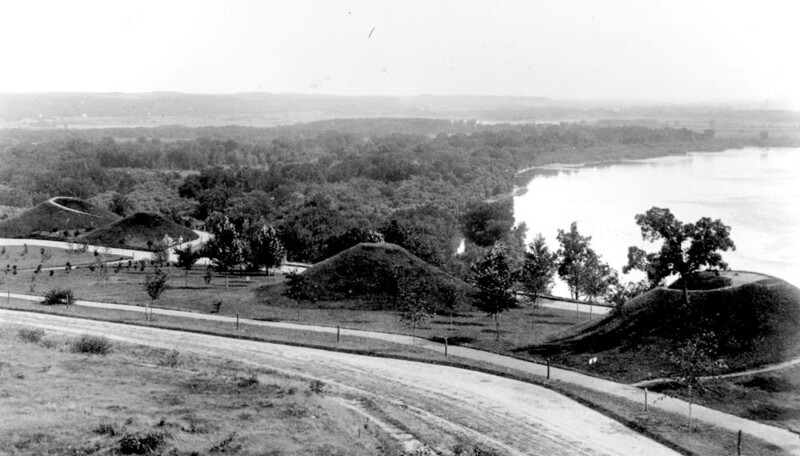 The cemetery to which Carver referred was likely the configuration of numerous mounds lining the bluff above the cave, a few of which are now protected in St. Paul’s Indian Mounds Park. Rather than being an accurate record of what had happened, this explanation may have simply been a stab at accounting for the fact that some burial mounds did not appear to have surviving burials in them. But modern Indian people and their desire to continue to use mounds as cemeteries were never the gravest danger to these mounds. In a pamphlet published in 1974, Reinhold O. Werner described all the burial places of Kaposia located in the city of South St. Paul. The account is mainly a catalog of mounds long gone and a chronicle of their destruction. Many of the mounds were lost through excavation for sand and gravel. One set of eleven mounds known as the Silk Mounds lay on a bluff east of the city’s municipal building. 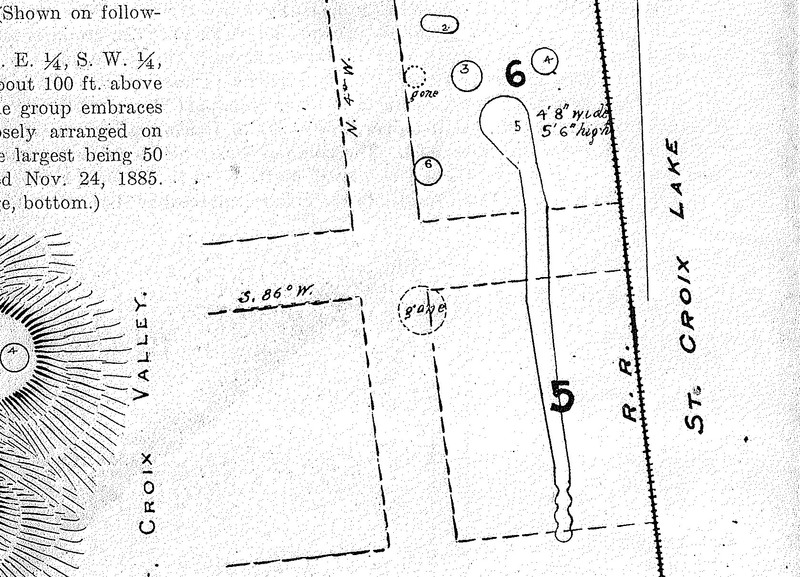 One of these mounds was 180 feet long, 42 feet wide at the widest, and three feet high Werner wrote that these mounds were the largest recorded burial places in South St. Paul. “This must have been a very impressive sight along the brow of this bluff to see those eleven mounds in a row.” The northernmost mounds were removed for a sandpit, the rest of the mounds were taken out when nearby streets were graded and homes were built. A recent compendium entitled Minnesota’s Indian Mounds and Burial Sites, by Constance M. Arzigian and Katherine P. Stevenson, published in 2003, states that Minnesota “has 11,000 recorded prehistoric and early historic Native American earthworks and burial mounds,” but also records in excruciating detail how thousands of them have been destroyed through plowing, road construction, vandalism, and archaeology. Today there are strong protections for burial places in Minnesota Statutes. But though the law prohibits the destruction of cemeteries it provides no sure means for their preservation. Under pressure for development, ways are still found to destroy mounds. Not fully valued as a part of the present-day landscape, mounds continue to disappear. What reasons do people have for caring about the burial places of people long dead, individuals they may never have known? With communities under assault it is not hard to find an explanation. If a community’s very existence is in question and its tie to traditional homelands is denied, then protection of cemeteries is a question of justice, not merely sentiment. The treatment of human remains and burial places is a reflection of the way the living group of which they are a part. If the living group is treated badly, the treatment of the community’s remains will reflect that fact. “The white men have stolen the Indian land from them. Now, not satisfied, they would tear up the bodes of the Indian dead in order that they may have even the last resting place of our ancestors.” A nephew of the La Vierges, Charles Drew said: “I will die fighting.” In response to such complaints the Indian agent at Cloquet, George W. Cross, stated that removal of the remains would be “a great deal more satisfactory,” because they could be more properly cared for in a new location in Superior. 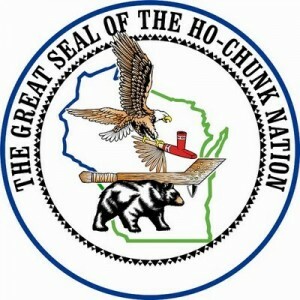 He invited “Indians who have relatives buried on Wisconsin Point” to write to him “giving the number of their relatives buried there” and stating their preference as to where the cemetery should be located in Superior. Subsequently the cemetery was removed, but no commercial development was ever placed on the location, which remained in federal hands. The new cemetery is, ironically, now eroding into the Nemadji River. Now more than 90 years later an effort is underway by the Ojibwe community to get back the land and put the remains back in their original location. Sonny Peacock, chairman of the Fond du Lac band, stated in 2003 that his community remembered well the events of the cemetery removal. “We know the names of many of these people that were there. 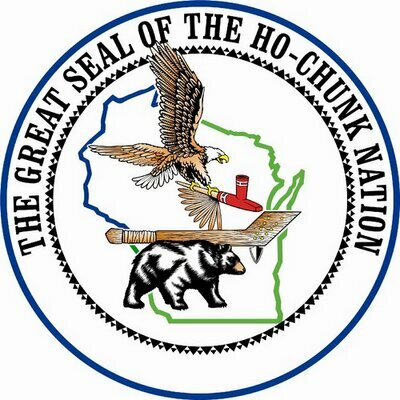 And we have a history of those individuals.” At the urging of Bob Miller, founder of the Superior Indian Center, the Fond du Lac band put in a bid to obtain the land from the General Services Administration. The tie of the La Vierge family and of other Ojibwe people from that area to the cemetery at Wisconsin Point is not difficult to understand. It has to do with a reverence for a people’s ancestors, but it also relates to a people’s long term connection to a place and the knowledge that that connection is suppressed and denied. It is a question of simple justice. In the spring the grass lies matted, uncut and untouched, on the mounds in Indian Mounds Park, high above the big bend in the Mississippi, where the river completes its course through Minneapolis and St. Paul and heads south. This sacred site, documented for hundreds of years, has been contested for the generations. Today there are only six of several dozen mounds left. In recent years it took action by the Minnesota Legislature to prevent intrusion by a local power company that would have marred the area of the park and the mounds. Once deemed sacred only by Indian people, these mounds have come to be respected by the community in which they are located. The six mounds are now surrounded by iron fencing. Signs read: “Indian Burial Sites” and ask visitors not to enter the enclosure or walk on the mounds. The fencing has not always been there. Earlier generations of visitors climbed the mounds for the view and picnicked on the grass. Old photographs show walkways laid out in a spiral on several mounds, and other irregular paths worn into the slope from frequent climbing by visitors. For European-Americans there may have been no sense that these mounds were in any way sacred or that even if they were, that there was anything that ought to prevent climbing, sitting, and eating. For Dakota people mounds like this are sacred both as burial places and as special places in the landscape. For both reasons mounds are believed to be places that should be revered and treated carefully. This is not to say that Indian people in all places agree on exactly how mounds should be treated. Differences depend in part on the context in which the mounds are located. The impressive Manitou Mounds—located above at Kay-Nah-Chi-Wah-Nung, “the place of the long rapids” on the Rainy River, on the Canadian side of the Minnesota-Ontario border—are not fenced like the mounds in St. Paul’s Indian Mounds Park. One difference may be that these mounds are on the grounds of the Rainy River First Nation visitor center, on land controlled by the this Ojibwe community. This context protects the mounds from the desecrations that might occur in a busy city park. The conflict between a so-called utilitarian view of mounds and a sacred view is evident in a recent controversy in the town of Chaska on the Minnesota River in Carver County, Minnesota. In early May 2005, the city came to a wrenching decision to put a rope barrier around the largest of three mounds in the city’s park during special events such as the city’s Taste of Chaska celebration. As a result of efforts by of a city resident, John Varone, and a Native person, Wally Ripplinger, and other members of the Chaska Human Rights Commission, the city council voted 3-1 in favor of taking this step to educate the public about how to properly respect the mound. It is possible that some non-Indian people visiting Chaska or Indian Mounds Park in St. Paul, would have an “ours and theirs” experience, a sense of being kept out of a place marked off as part of someone’s else’s sacred beliefs. It might be argued that the fence separates the viewer from the place, undermining a sense of identification necessary to persuade the ignorant to aid in the protection of the sacred site. But the same might be said about rules that protect a cathedral such as Notre Dame in Paris. Visitors are welcome there to view a beautiful place, to pray, to contemplate, to photograph, but not to throw frisbees or have picnics. What does it mean to say that something is sacred? In many ways it is simply another way to say that it is very important to a lot of people and should be treated reverently. Beyond that there is a lot of disagreement. Explanations about what general principles define sacred places differ. The consensus on definitions of sacredness varies from people to people, group to group, and generation to generation. For one generation, America’s Civil War battlefields were sacred ground, to be left alone, but for another, they were development properties. It is not necessary to walk on a mound or dig it up to experience its beauty, to appreciate its graceful form. Mounds are beautiful in their shape and form and in their placement in the landscape. It must be believed that those who built the mounds had a highly developed sense of beauty, creating something comparable to the landscaping done in European and American cemeteries, but simpler and more restrained. Mounds have a beauty and consoling power, which provides yet another reason to preserve them even if it cannot be proven that there are human remains within them. Colhoun understood one important main purpose of Indian cemeteries such as mounds—to proclaim through the Native American forms that they were in fact burial places, cemeteries, places to be respected, to be appreciated, to be left alone—though he regretted the lack of text in any language he could understand. But what more text is necessary than the beauty and form of a place that communicates its sacredness and its function as a cemetery, even to an outsider like Colhoun? This too is a kind of inscription on the landscape, one fairly clear in its meaning. Those who built the mounds may have thought that it would be plain to everyone who saw them that they are sacred and should be left alone, except for further burials. But such beauty was not always enough to prevent modern visitors from climbing on the mounds in Indian Mounds Park. And it may be that until such time as everyone understands the sacredness of mounds, then fences will be necessary, even if they make some people feel as though they are left out of the experience. “We have traveled there lately with my youngest son. We stop often, and I tell him how places got their names. I tell him the locations of the natural springs that flow out of the hills . We’ve walked up the hill to the old Fond du Lac village site, and I have told him the story of that place. I tell him where the graves are on the sides of the hills so he knows why certain places feel the way they do. It seems such a long time ago when other people showed me the same places and told me the same stories.” Thomas D. Peacock, in A Forever Story: The People and Community of the Fond du Lac Reservation. To bury someone in the ground is to rely on the respect of strangers. As a historian and anthropologist I have no more right than anyone else to decide which burial places should be left alone, untouched. I do not have to make such decisions. I rely like all people on a common consensus that in general all burial places deserve to be treated with respect. Only a few of my ancestors are buried in Minnesota. In this sense I come from a rootless people, not knowing what it is like to live in a place where many generations of my ancestors are buried. My father’s family was from Virginia, then West Virginia, Missouri, Kansas, and finally China, where my father was born to Baptist missionaries, almost a hundred years ago. My mother’s family was from Iowa, Illinois, Wisconsin, and Minnesota. Her father was a Methodist minister who received a new assignment every two years. My parents lived in Japan where I was born, then Denver, Manila, Paris, Washington, D.C., and Minnesota. Until I was fifteen what I knew of Minnesota came from my parents’ stories and from occasional summer visits. My grandparents lived in Zimmerman, then a small town, now a northwestern suburb of the Twin Cities. After their deaths my grandparents were both buried in a small cemetery just north of town, their graves marked by a common stone monument. My father, who died when I was sixteen, is buried on a hill above a stream on a piece of woods he bought in 1960. This land where he is buried is the closest thing to a permanent home that my family ever owned, the closest thing to having roots. My father’s ashes were put in a pottery urn and were buried in the ground. Later on we planted several balsam trees to mark the spot. My grandparents’ graves are well protected by being in an officially designated cemetery, marked by granite. It is not likely that these graves will be disturbed at least not soon. As for my father’s grave, I can control what happens to it only because my brother and I continue to own this piece of land. But what would happen if we did not own it anymore? Someone digging in the ground, finding the urn would come to the conclusion that this is a grave. But there is no assurance that his grave will be respected after I am gone, were this land to be bought by another family, people who never knew us. How would I want the remains of my grandparents and my father to be treated if someone came upon them at some point in the future, in the midst of a construction project? My hope is that there would be some acknowledgment both of the gravity of what was being considered and of the fact that the place where these remains were buried had significance. My hope is that the remains of my family members would be honored and marked in some way at the place where their remains were found, rather than being removed and erased from the landscape to be reburied in some distant, secret location. The case of the African Burial Ground in New York City is an instructive example. In 1991 the remains of 419 African Americans were found under a parking lot two blocks north of City Hall in Manhattan. The remains were removed from the ground by archaeologists, but twelve years later they were reburied on the same site at the African Burial Ground Memorial Site, where a permanent memorial is to be constructed. While the process through which all of this happened was contentious, the result seems to be a fitting solution for treating cemeteries of this kind, one that marks the presence and significance of those whose remains were found. Respecting burial grounds and their place in the landscape is important regardless of whether we share the blood of those who are buried in these places. But still, it might be asked: Why should it matter to an Anderson when the grave of a Peterson is disturbed? Why should it matter to a Swede when the grave of an Irishman is scattered? Why should it matter to an Ojibwe when the bones of a Dakota are removed from the ground? Why should it matter to a developer named McGough when the bones of more than 20 prehistoric people, name unknown, are erased from the landscape? The answer to all these questions is that all of us are diminished by the destruction of cemeteries even if those buried in them are unrelated to us by blood. When a society casually destroys burial places for whatever reason it means that the consensus that protects such places has broken down and needs repair. The disturbance of bones anywhere causes harm to every one of us. This is why the protection of American Indian burial mounds is important to society, to humanity, not simply to the presumed relatives of those in those mounds. If we cannot protect these mounds because they are burial places, because they are beautiful, because they have a consoling power, because they are historic, then in the end, no cemeteries, no sacred places, no places of historic beauty are safe. Those countless mounds, forming a “cordon along the blue horizon” will have disappeared forever and a great deal more will be lost. I realize that today is now the day after your “deadline” but let’s remember that the dead remain so in “living circles” according to our Indigenous,view…and deadlines are only for those temporary living colonizer-settlers who feel they must now disturb, bulldoze, and place their sewage near, on and around our relatives resting remains and spirits. 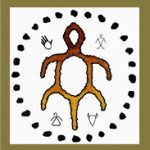 They left us their HUNKAKAN ancestors, stories and sacred landscape features to point us to the stars and show us how to live here on Turtle Island as good relatives between Sky and Earth which are mirrors. The River is the Milky Way and we Dakotas have a serpent constellation. This is not the appropriate time nor protocol for me to explain to outsiders how and why our star stories and these sites must remain to teach us. Recently, my wife and I have published a scholarly article on the rattlesnakes as represented in nearby upstream cave petroglyphs. Please inform yourself beyond the superficial “soil survey.” We know these sites exist and are part of a larger network of effigy mounds throughout the river valley system and represent our ancient cosmological origin stories. You must understand that your colonizer names and places can never know or understand our living presence here unless you care enough to learn and ask us. My name is Jim Rock and my wife is Dr. Roxanne Gould. Thank you for reading this if you can still recognize that deadlines are for the shortsighted living only. I have many books and resources to offer you some of which I have authored and others from my father and relative who represent 10,000 years of phenology right here. My opinion is that the sewer lines should NOT go through the Native American effigy mound. State: we want to run a sewer line through your sacred and historical effigy mound. Me: Can we run a sewer line through Ft Snelling or Arlington Cemeteries? State: Because they are sacred and historical burial places. Me: The same reason why you can not go through the Afton effigy mound. The THPO for the Iowa Tribe of Kansas and Nebraska protests the Afton Wastewater Treatment project. The THPO office of the Iowa Tribe of Kansas and Nebraska adds it voice to that of other tribes in protesting the plans to pump sewage through the Rattlesnake Effigy Mound, in Afton. Such mounds are located in places vital to the health and well-being of the land, as well of the people who live nearby, both Indian and non-Indian. We are descendants of the Oneota and Woodland People who lived in southern Minnesota, until we moved southward about the year 1700. The Rattlesnake Spirit, Wakandhi, is a guardian of the springs which pour forth water for all our benefit. Water and Life are the same thing in our Ioway language: Nyi (nyee). There are also likely burials in the mound, protected by both state and federal laws. If a pipe of sewage is run through such a Mound, then according to traditions, the waters will be fouled, and disease, pests, and drought will follow. We ask that you consider this while making your decision, and realize we are concerned for all, including the residents of the area, your own people, as well. On December 31, 2015, I caused a letter to be sent on behalf of the Rattlesnake Effigy Mound in St. Croix Valley, Afton Minnesota. The City of Afton applied for a permit with the MPCA for construction on a wastewater treatment plant on the location of the Rattlesnake Effigy Mound. The National Historic Preservation Act (“NHPA”) provides legislative mandates for environmental review and consultation requirements, and demands that planners of a federally supported project take into account its effect on any area eligible for inclusion in the National Register of Historic Places. 16 U.S.C. S. § 470f; 16 U.S.C.S. § 470a (a). The NHPA provides that planners shall consult with any Indian tribe that attaches religious and cultural importance to an eligible affected area. 16 U.S.C.S. § 470a (d)(6)(B). Consulting tribes are entitled to a reasonable opportunity to identify concerns about historic properties, advise on the identification and evaluation of historic properties, including those of traditional religious and cultural importance, articulate views on the undertaking’s effects on them, and participate in resolving those effects. §§ 800.3-800.7. On May 20th 2016, the MCPA met with Tribal representatives in the Minnesota area for a Tribal Consultation. During this consultation, a concern was expressed regarding mammal bones found on the site of the Rattlesnake Effigy Mound. A follow-up study was promised to determine if the mammal bones were human. As an interested Tribal party, I am writing to request that all construction efforts halt until the promised study has been conducted. Pursuant to 36 C.F.R § 800.4(d)(1), and via this communication, an objection is now being presented in the allotted 30-day time period. Until evidence has been presented to rebut the existence of human remains on the site of the Rattlesnake Effigy Mound, the project cannot move forward, as doing so would irreparably damage the historical and cultural integrity of the Rattlesnake Effigy Mound under the NHPA and the Native American Graves Protection and Repatriation Act (“NAGPRA”). Any movement forward without a final study, discounts credible evidence of human remains on-site of the Rattlesnake Effigy Mound, evidence that is known to the MCPA. Please contact me, or Legislative Attorney Gennafer Garvin, at the Ho-Chunk Nation Legislative office for further guidance. Finally, our concerns echo those of other tribal nations, and additional government-to-government consultation is needed so tribes can provide valuable input that can mitigate potential losses for both sides in the future. It is with my highest recommendation that a mitigation plan be created for avoidance of directional drilling under and within the buffer zone of the Rattlesnake effigy mound. The possibility of further desecration to this sacred area alarms tribes, in that there is an increased potential for loss of significant archaeological and cultural resources that contribute to our traditional cultural and ecological knowledge that has maintained our way of life. Thank you for your time and effort in considering our comments. 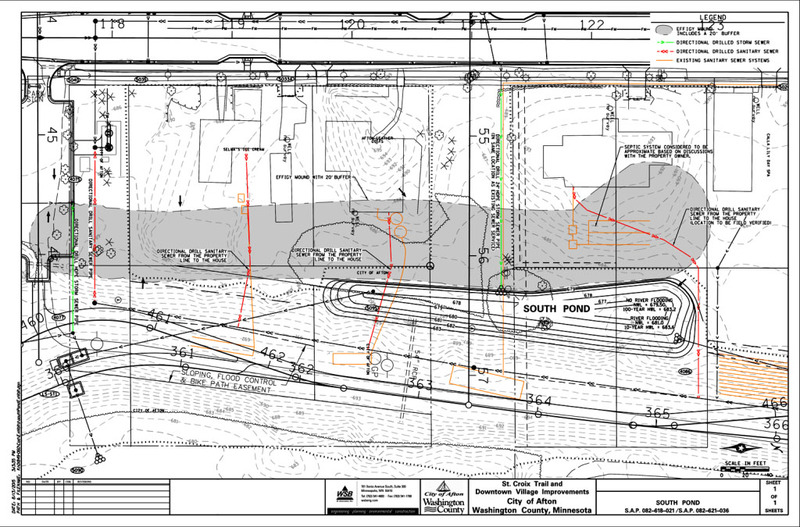 We are writing in response the MPCA section 106 findings on the City of Afton Old Village Improvements Project dated August 2, 2016 as per our responsibilities in the Section 106 process according to the National Historic Preservation Act of 1966 (as amended). As per the 36 CFR 800 regulations and specifically 36 CFR 800.5 (c)(1) we are now providing written documentation of objection to the MPCA’s finding of no adverse effects. The Sisseton Wahpeton Oyate and the Tribal Historic Preservation Office, on behalf of our cultural preservation board and numerous other concerned tribes and tribal members of the Oceti Sakowin, has made clear and continued effort to address the issues surrounding this project since first notification and particularly since February 19, 2016. At that time, we conveyed critical concerns about the lack of defined area of potential effect (APE) and stated that certainly for us as a Dakota tribe and a part of the Oceti Sakowin, we define the area of potential effect to be the entire area of the mound including the exterior areas of the mound site as a part of the burial site with the potential for disturbance of human remains. I would like to refer to the attached letter by Nigel Parry to Tamara StJohn and the SWO THPO, Sept 1, 2016. This letter relates to the artifacts and human remains at the site and also acknowledges the Minnesota cemetery law. The letter also speaks to our assertion of the mound complex with potential for burials in between the mound areas to be significant. We would like to reiterate that the entire area as a whole is a part of the cultural teachings including oral history identify more than just the mound itself to be of importance to the Dakota and Oceti Sakowin. I am attaching an email from Crow Creek Sioux Tribe THPO stating their opposition to the determination as well. I will also be requesting that the other tribes who have brought us concerns about the project, attach their comments with ours as a part of the Oceti Sakowin and aboriginal tribes. The SWO THPO continues to concur with the MnSHPO in the determination of Rattlesnake mound (21WA10) as being eligible for listing in the National Register of Historic Places (NRHP) under criteria A, C, and D and with the reiteration of recommendation that the evaluation of the site be fully documented according to the Secretary of the Interior’s standards for evaluation as well as the requirement for archaeological survey and inventory. SWO THPO also recommends that the field site N5.5 E12 now (21WA0166) be evaluated for NRHP eligibility. It is our determination that both sites as National Register eligible properties, should be afforded protection as such under the National Historic Preservation Act. The Sisseton Wahpeton Oyate and the SWO THPO do not agree with your determination of ‘No Adverse Effect”. The recently complete comment period for “consulting parties” in relation to the Afton Wastewater project has compiled a record of overwhelming objection to the (Minnesota Pollution Control Agency’s (MPCA’s) finding that there will be “no adverse effect” of the project on the Afton Effigy mound and other mounds in the mound group, a site which consultants have stated is eligible for listing on the National Register of Historic Places. Not a single tribal group from within and outside Minnesota has agreed with the MPCA. All their comments must be read carefully by anyone seeking to form an opinion about the effect of the wastewater project on this sacred and culturally important place. All these comments will be transcribed and made available on this website. To start with here is a transcription of the letter submitted by all four federally recognized Dakota communities in Minnesota, located at Prairie Island, Shakopee, Lower Sioux, and Upper Sioux. In an unprecedented and eloquent letter the communities unite in their rejection of the MPCA’s finding. Thank you for initiating consultation with the four Mni Sota Dakota Nations (Prairie Island Indian Community, Shakopee Mdewakanton Dakota Community, Lower Sioux Indian Community, and the Upper Sioux Indian Community) Tribal Historic Preservation Offices (the “THPO”). We appreciate the opportunity to provide comment on your proposed undertaking. Unfortunately, we have had vacancies in some of our THPO staff and only now are able to forward response. We would like to provide additional response as soon as possible. In accordance with 36 CFR 800.5(c)(2)(i) the four Mni Sota Dakota Nations disagree with the Minnesota Pollution Control Agency (the “MPCA”) which was the Lead Federal Agency for completion of the Section 106 Findings (the “Findings”) through a programming agreement with the U.S. Environmental Protection Agency regarding Rattlesnake Mound Effigy Group, Site 21 WA 10. It is heartening to have affirmation in the Findings and the Phase II Archaeological Assessment and Evaluation of the significance and importance of the Rattlesnake Mound Effigy Group. Also it is significant for the various stakeholders and consultants to acknowledge and appreciate that this site has been negatively impacted previously and such impacts should be address. However, to say that the wastewater project will actually help the Rattlesnake Mound Effigy Group does not make sense. With the site’s significance, rehabilitation and mitigation should be done in the first place even though there have been impacts from previous construction. Even permitting directional drilling under the Rattlesnake Mound Effigy Groups does not appear to protect or respect the site and its significance. Regarding undisturbed and disturbed burial sites exterior to the Rattlesnake Mound Effigy, we are not confident that those have been completely identified to date. No one can assure that the previously impacted areas do not have human remains that may surface with new earthwork. These are just some of the concerns we wish to have addressed prior to any construction. Further, at a minimum our THPO Officer(s) or their designee(s) should be present if construction moves forward in case human remains are discovered and other cultural patrimony are identified. We appreciate how the law looks at such matters. However, from cultural and spiritual perspectives any disturbing of the Rattlesnake Mound and surrounding area no matter the size of the buffer zone or that it has been disturbed before is extremely concerning[,] requiring further attention. This area is a sacred site eligible for designation as a National Historic Place [National Register of Historic Places] meeting at least three criteria for such a designation. Further disruption and disturbance would be a clear hindrance to protecting the historic properties of the site. Therefore we disagree with the Findings and demand additional dialogue and consideration as to the appropriate ways to protect the Rattlesnake Mound Effigy Group and its surrounding area including further consultation and participation in the process.